Transport Phenomena in Micro- and Nanoscale Functional Materials and Devices offers a pragmatic view on transport phenomena for micro- and nanoscale materials and devices, both as a research tool and as a means to implant new functions in materials. 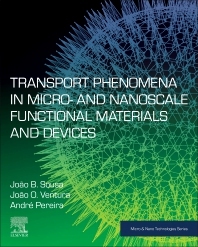 Chapters emphasize transport properties (TP) as a research tool at the micro/nano level and give an experimental view on underlying techniques. The relevance of TP is highlighted through the interplay between a micro/nanocarrier’s characteristics and media characteristics: long/short-range order and disorder excitations, couplings, and in energy conversions. Later sections contain case studies on the role of transport properties in functional nanomaterials. This includes transport in thin films and nanostructures, from nanogranular films, to graphene and 2D semiconductors and spintronics, and from read heads, MRAMs and sensors, to nano-oscillators and energy conversion, from figures of merit, micro-coolers and micro-heaters, to spincaloritronics. João Oliveira Ventura is a Research Scientist at the Institute of Materials Physics, University of Porto, Portugal, where he has worked on nano-fabrication since 2008. His research interests more widely include spintronics, nanostructures, magnetic nanostructures, ion beam deposition, and lithography. João Bessa Sousa is Professor at the Department of Physics and Astronomy, University of Porto, Portugal, His research activity focuses on micro and nanotechnologies, particularly spintronics and their applications in magneto-optical and self-organization at the nanometer level. He has published over 260 articles in peer-reviewed international journals. In 2004, he was made Commander of the Order of the Sword Sant`Iago, one of Portugal’s highest civil honors. In 2005 he was awarded the Prize for Scientific Excellence by the Foundation for Science and Technology. João Pedro Araújo is Assistant Professor of Physics at the University of Porto, Portugal. His research focuses on the preparation and fundamental studies on materials exhibiting strong interplay between electronic, spin, orbital and lattice degree of freedom. His is also working on thin-film preparation (Ion bem Deposition and Laser Ablation) and physical aspects of nanodevices, in particular spinvalve and tunnel-junctions. He is interested in bottom up-approaches for nanofabrication namely using nanoporous alumina templates and on using them for various application ranging from optics, solar/water-splitting –cells up to biotechnological applications. André Pereira is Assistant Professor in the Department of Physics at the University of Porto, where he has worked since 2013. His research focuses on the development of innovative devices and sensors for micro/nanopower supply, Thermalt sensors and temperature control. He has also worked on magnetic nanoparticles and silica nanoparticles for use in catalysis, biomedical application (MRI and hyperthermia) and textiles. Paulo Freitas is Professor of Physics at the University of Lisbon, Portugal. His current research interests include GMR heads for ultra-high density recording, spin-dependent tunneling junctions, non-volatile memories, magnetic multilayers and thin films, micro magnetism, transport phenomena, GMR sensors, bioelectronics and biosensors. He is the author of more than 350 scientific articles, one patent and inventor of a bioelectronic device.